Every contact lens wearer knows that they would struggle to do many things without wearing the products, from taking part in sporting activities to walking down the street. 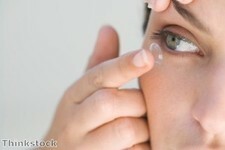 One very famous contact lens wearer is the tennis ace, Novak Djokovic, who would be lost without is contacts. However, it is not only sportsmen and the rich and famous who rely on contacts, as was recently noted by Hanna Brooks Olsen, writing for BlissTree.com. She explained how her eyesight originally began deteriorating at the age of 14 and, by the time she got to 17, her vision was so bad that she had to visit the optometrist and have glasses prescribed. However, she was not fully content with this form of vision correction and at the age of 20 had contact lenses fitted  and has never looked back. "First, let"s start with why I love my contacts. Primarily, I love them because they let me, for the most part, live the uncomplicated life of a properly sighted person. I don"t have something on my face at all times, which can get surprisingly irritating," Ms Olsen Brooks explained. She added that another major benefit of wearing contact lenses rather than glasses is that they do not steam up when she walks indoors, and she does not have to take them off when she practices yoga. Ms Olsen Brooks noted: "When it rains, I don"t have to use my fingers like teeny, tiny windshield wipers and I can look down at things (like the sidewalk) without fear of losing my glasses down a storm-drain." She described these as "awesome perks" of living a glasses-free life and admitted that, although there are things to consider such as using contact lens solution, they generally allow her to stay active and make her working day more productive.